Experience the thrill of driving your personal vehicle around the 1.5-mile speedway oval, all to benefit Speedway Children’s Charities. After you take your laps, you can celebrate with a picture taken in Victory Lane. 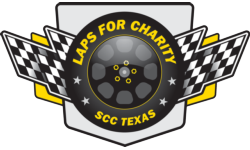 For $40 you can take 3 laps around the track, get one Laps for Charity t-shirt, and then go enjoy our car show, live music, food and beverages! Price will increase to $50 the day of the event and additional sets of laps are $30 each. Photos in Victory Lane will be $10 and any additional t-shirt purchases will be $15. Don’t want to drive on the track but want to join in on the fun? Various pricing and sponsorship options are available – give us a call at 817-215-8421 for more information!